After your child has outgrown their forward-facing seat, they should move to a belt positioning booster seat. A belt positioning booster is either part of a combination seat, a high-back booster seat, or a backless booster seat. Unlike rear-facing and forward-facing seats that use a harness to keep your child in place, a belt positioning booster seat uses the lap and shoulder seat belts in your vehicle. However, lap and shoulder belts are designed for adults, so a belt positioning booster seat raises your child up to make the seat belt fit properly. Note how I keep referring to lap and shoulder belts. Booster seats must be used with a lap and shoulder belt and never a lap-only belt. 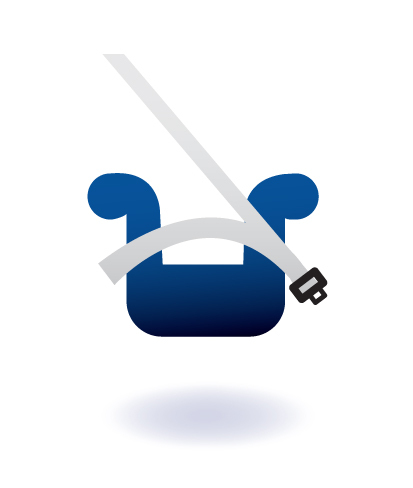 If your car only has lap-only belts, use a forward-facing car safety seat with a harness and higher weight limits. Other options are to see if shoulder belts can be installed in your vehicle, use a travel vest that can be used with lap only belts, or buy a different car with lap and shoulder belts. Besides what type of seat belt your vehicle has, you must also see how your vehicle’s rear seat is set up, are the seat backs high or low, are there headrests. Combination seat boosters and high-back boosters should be used if your vehicle has low seat backs or no headrests. However, check the instruction manual with your seat, some of these booster seats still require that the vehicle seat have high seat backs or headrests. Backless boosters should only be used if your vehicle has high seat backs or head rests. How do you know the booster seat fits your child properly? The lap portion of the seat belt should be low, across your child’s upper thighs, not on their abdomen. If the seat belt is on their abdomen, serious abdominal injuries could happen in a vehicle crash. Then, the shoulder portion of the seat belt should cross the middle of the child’s chest and shoulder, not digging into their neck or falling off the shoulder. 1. Does the child sit all the way back against the vehicle seat? 2. Do the child’s knees bend comfortably at the edge of the vehicle seat and their feet are flat on the vehicle floor? 3. Does the belt cross the shoulder between the neck and arm? 4. Is the lap belt as low as possible, touching the thighs? 5. Can the child stay seated like this for the whole trip? If you answered no to any of these questions, you need to keep your child in a booster seat, regardless of what the laws in your state are. Most states have now passed into law “booster laws” that state children need to remain in a child car seat or booster seat until age 8 or a height of 4’9″. If your state doesn’t have this law or even if they do have this law, it is highly recommended that you follow best practice and keep them in a booster seat until they pass the 5 step test. You may ask, but won’t my child be made fun of by his/her friends if still in a “baby seat”? Well, first off, the minimum age and weight for most boosters is 40 pounds, which most kids don’t reach until between ages 3 and 4. Boosters are definitely not “baby seats”, they are for big kids. Second, by not using a booster, the injuries sustained in a vehicle crash would be a lot worse than some teasing by friends. Plus, it is now the law in many states to continue using a booster until age 8 or 4’9″. Don’t be in a rush to stop using a booster seat. This report talks about the importance of using a booster and the injuries that may be received if a booster is not used. One last note, when a booster is not occupied, still buckle it in using the seat belt. This will keep the booster from moving around in the back seat or from becoming a projectile in a crash. Some booster seats are now available with LATCH clips to keep the booster in place when not occupied so you don’t have to remember to buckle it in each time.